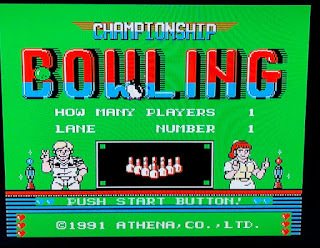 Championship Bowling is a bowling video game for the Nintendo Entertainment System (NES) and released in the US in 1991 from Athena Co. I mentioned that I found this game with a plastic case at Goodwill for $1.99 which you can read about here. 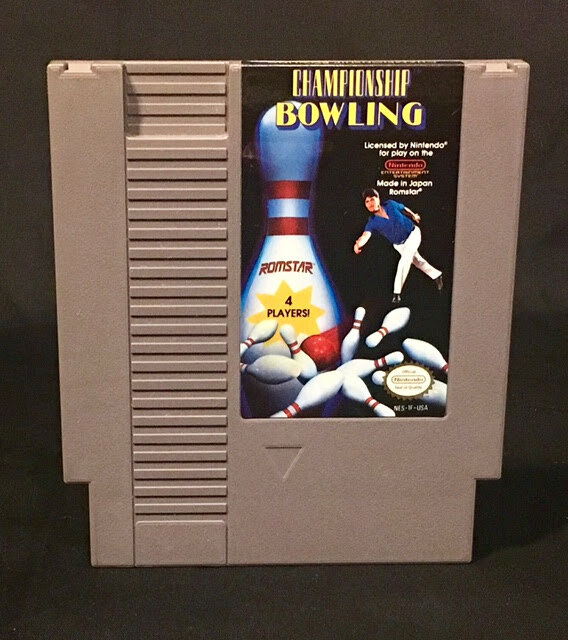 When I bought this game I assumed that I would add it to my NES collection and be done with it. While playing with my NES the other day I broke this game out to see how bad it was. To my surprise, I actually like this game. 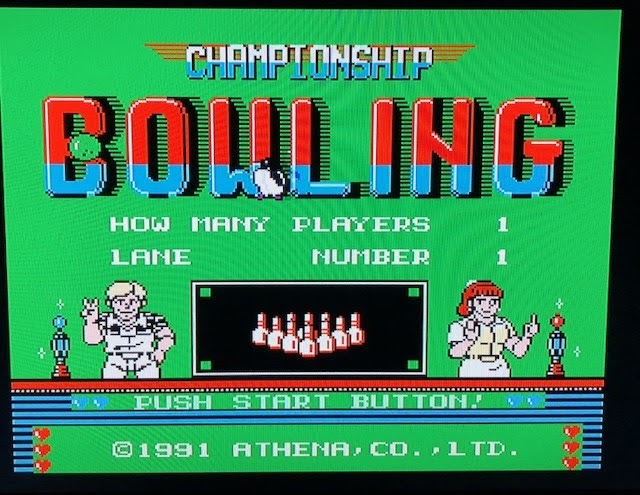 In Championship Bowling you can play with up to four players total which is nice as I feel that this game would be a fun game to play with a crowd of friends. Besides the number of players you can also pick from four different characters to play as, and as far as I know, they are all the same so it's purely preference. Lastly, you can change the color of your ball. 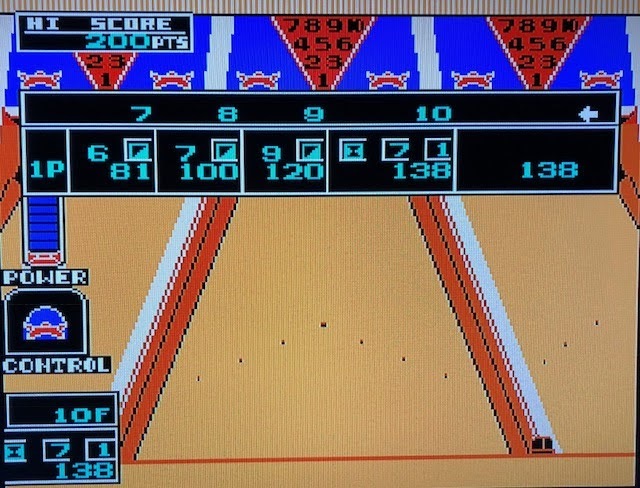 Once you've made your selections it's time to bowl. 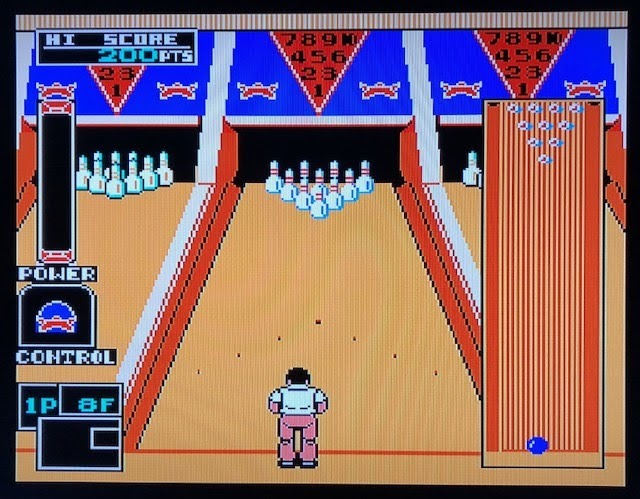 Bowling in this game is rather easy and has three steps. First, you move your character left and right in front of the alley. Next, you tap the A button to control the ball's spin. On the left, you can see the current frame at the bottom of the screen. Above that is a blue thing labeled control, when you press A a selector will go from left to right and back again. You choose how you want the ball to spin, to make it go left you want to tap the A button to the left and so on. When the ball gets near the pins the spin will kick in and move your ball the way you've chosen. Above control is the power indicator. After you've chosen your control the power bar begins to go up and down and repeats until you make your choice. This moves pretty fast so you'll want to let it go a few times as you time your A button. You'll tap the A button and your character will release the ball which will go down the lane the way you've set it. 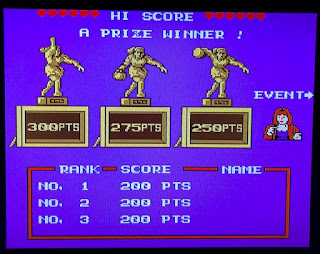 As you play you'll get the hang of the timing and you'll see your score increase each game. 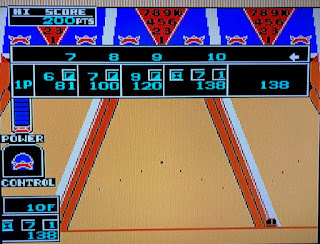 The game has you bowl ten frames. 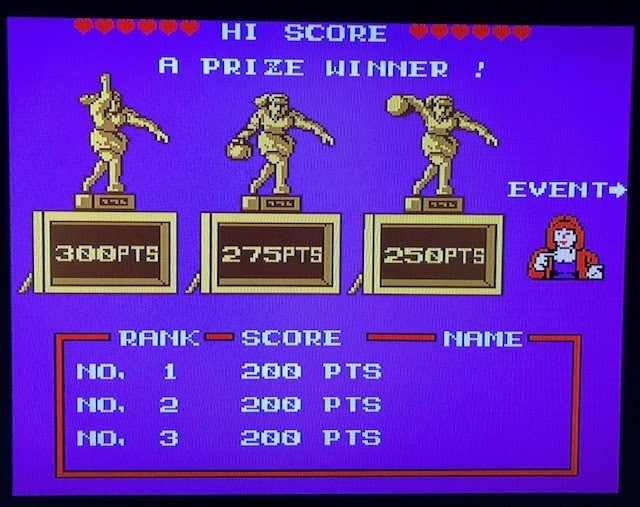 Once you've hit 10 the game ends and if you're playing solo you'll get a trophy; bronze for 250 points, silver for 275 points and gold for 300 points. That's Championship Bowling in a nutshell. I actually had more fun with this game than I thought I would. The controls are pretty simple to figure out and the more you play the better you'll get. 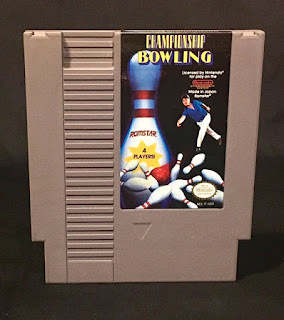 If you like bowling games and like the NES then this is the game for you. Similar to classic arcade games you'll pretty much play to beat your score although multiplayer will open up some fun with your friends. 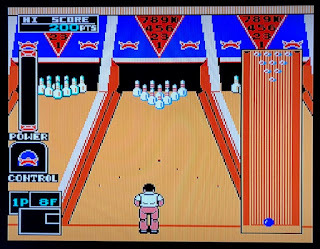 I give Championship Bowling a 6 out of 10. My best score, I need to practice.